Some people will claim it was the plight of the great loblolly pines nestled in the White Oak bottomland behind the Garver farm that drew my eyes skyward and pulled my feet from the earth. That it was the plans of Hatch and Brownfield Construction Company that made me climb and perch - their senior housing, nursing home village, and rehabilitation center a nightmare for the blackwater river basin by a Medicare bonanza for the developers. A few may make mention of the divorce as the cause, Dwayne finally packing up his model car collection and sweeping out the garage, tidying up his side of the room like he was getting it ready for my next husband. But the truth is not one of those reasons really explains why I came up here. It wasn't grief or boredom or political grandstanding. It wasn't even the red-cockaded woodpecker, critically endangered and not usually expected n a loblolly but rather in a longleaf pine forest, that was spotted first by Lilly Carol sitting high on my shoulders sixteen days ago on the outing to plant pine sapling back behind the dilapidated barn and deep into the tangle of old trees. When I first started this book, I had no idea where it was going. It started with Kate climbing up a loblolly tree and making herself at home there. I hadn't read anything about the book and had no idea what to expect. If you feel the same way when you start reading - I have one important piece of advice - KEEP READING! 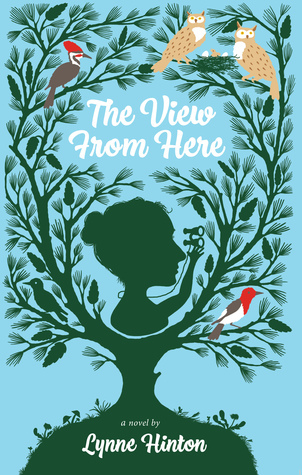 I was absolutely enthralled with Kate's far-reaching view from her perch in the tree and with all of the people who came to visit her in her temporary home. Everyone in town had different views on why she climbed the tree - was she protesting a nearby building project? was she trying to get noticed? was she having a nervous breakdown? Or was she reviewing her life and getting a wider perspective on how her past was affecting her future? Read this book and find out more about Kate - about love and family and friendship. You'll be very glad you did -- I know I am.